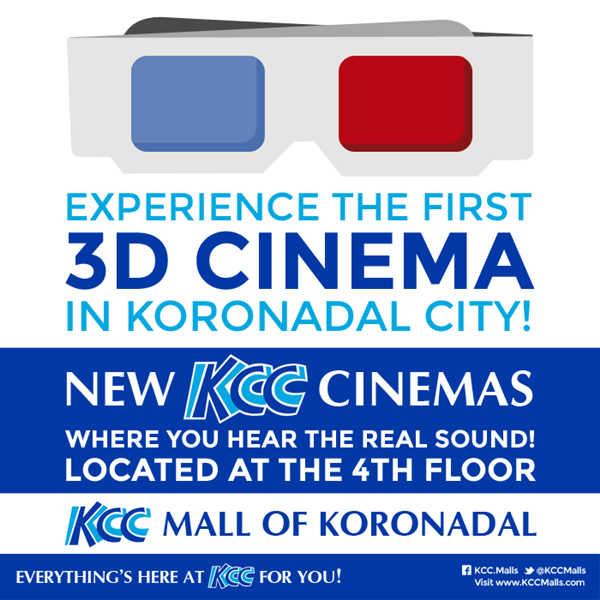 3D Cinema now in Koronadal City! Finally, the long wait is over, digital and 3D movies can now be fully enjoyed in Koronadal City. Yes, no need to go to nearby General Santos City to watch movies in 3D Cinemas with the opening of the new KCC Cinemas located at the 4th Floor of the New Mall Building of KCC Mall of Marbel. Opened last October 30, 2013, the first 3D Cinema in Koronadal City (Cinema 4) has the hit action-adventure movie "Thor: The Dark World" as its first 3D movie offering. Experience "Thor: The Dark World" in 3D for P120.00! Rush now to KCC Mall of Marbel.